Members of the Fed DUSC Committee last night met with DUFC Chairman Stephen Thompson , Board Members Derek Robertson and Colin Stewart and the Communications and Media Manager Joe Rice to discuss improving the fans match day experience at Tannadice. The meeting was the first of what will be a regular , possibly quarterly , meeting at which fans ideas and issues will be raised and responded to with a view to improving the all round experience of visiting Tannadice on matchday. The Fed had gathered the initial core questions through feedback from our members , comments left on our facebook page and also from browsing the DUFC Forums on the internet. The clubs response in our opinion was very positive and although some of the items cannot be put in place or addressed overnight they have confirmed they will look into every matter raised and respond on items they could not give an answer to on the night and we will post the answers to keep Arabs informed on here , our own website and our facebook page. The following was the initial 20 questions put to the board and Joe and their responses. Pricing - Club were aware re walk up gate prices being perceived as to high by fans but stated that the most complaints they receive when they reduce prices are from season ticket holders ie "whats the point in me buying a season ticket" !! . They also confirmed that in the past when they have lowered gate prices or tried bring a friend schemes etc there has been little or no impact on crowd figures. They do though wish to hear further comments on how this situation could be balanced between the season ticket package and pay at the gate customers and we would welcome suggestions. Poor Catering - The current catering company are contracted to 2015 . The club though will approach the company to discuss the issues raised re quality of food and pricing although they did comment that they have never received a written complaint previously re the catering that allowed them to approach the catering company to discuss. Stewarding - Again the club were aware re the complaints . The club have a new stewarding company in place this season and they are confident that the companies approach will improve the situation although this will be monitored and again responded to throughout the season if issues are raised. Same treatment for home supporters as away fans - This item was in the main relating to standing at games . The club are discussing this with both the stewards and the police and have asked the to adopt a like for likeapproach on match day although it should be noted that club are still subject to ground regulations on this matter. Again this will be monitored during the season. Poor Tannoy System - Club will look at this but asked if the individuals that raised this could confirm where they sit to allow them to comment. Fed will try and follow up. Improving the appearance of the concourse in the ET and George Fox - This is happening now and is an ongoing process . Pictures and Paintings relating to the club are being put up and the club would welcome further ideas on this. Make some parts of the George Fox a family section - The club felt they had basically made a section of the George Fox a family stand with the season ticket deal but appreciate that certain individuals may not be behaving in the area in a manner associated with a family section . They will respond to any complaints received going forward. Singing Area - Club were very receptive to this but were looking for the individuals who would be willing to organise the same to get in touch to discuss how it can be taken forward and where it can be best situated to avoid conflict with existing season ticket holders seats. Fed will discuss with members and put suggestions back to the club. Fan Displays / Flags / drums etc - Club again were receptive to this and want it to happen but asked if displays etc were going to be arranged then the fed are used as the initial contact to ensure the club is aware and necessary arrangements can be made. They did though confirm the crowd surfing flags are a big no due to fire implications. As the Shed will be shut for most games this season the club are happy for the Bigger (or any for that matter) Flags etc to be displayed in here on matchdays and the fed will ask one of their members to act as a point of contact for organising this. Alcohol - The club are looking at ways to making alcohol available at the games in the stadium and are discussing the same with authorities. The club though did note that not all comments they had received from fans re this were in support . Smoking - The club will look at ways of trialing a smoking area to the rear of the ET Stand at halftimes . As with the alcohol though not all comments received from fans on this were in favour of the same. Bookmakers - The club have approached a number of bookmakers with a view to taking up a shop in one of the home stands but have been re-buffed on each occasion...if any individual knows of anyone to progress this please get in touch through the fed. Smarten up stadium - Various maintenance works are ongoing which should make the stadium look sharper . Again if anybody notices something please get in touch and it will be addressed. Half Time Entertainment - Joe confirmed this and also pre match entertainment is being looked at . Joe has attended various fan experience forums this summer and has been tasked with trying to implement some of the ideas put forward at these forums . As ever fans input is vital here and we welcome any suggestions that can be looked at. Allowing Children in Heggie Suite on matchdays - Club were receptive to this and will discuss with Bill Wallace to confirm if this can be done . If it can club will confirm through their media. Improve Club Shop - Club asked for items to be made more individual and they will respond ie what do fans want to see improved. They did state their own feedback on the shop was that fans were now happy with the merchandise available. Saturday 3pm KOs - The clubs preference would also be this but they are tied with the TV Deal . Utd do seem to have been on TV quite regular last few seasons but this goes with the territory of being relatively successful and attractive to TV companies. They did though say they are pushing for consistent KO Time and Day for the TV games and they would welcome thoughts on what fans preference would be for TV Games. Music played before and at half time - Club happy to play whatever we want !!! Joe asked if suggestions can be made to him through the clubs FB page and he will present to the stadium announcer. The above list is our starter for 10 so to speak and will evolve with each meeting. Everyone will have an opinion on matchday experience and what one person thinks is fantastic another may complain bitterly about but the club are now very willing and want to hear from Fans and hopefully through the various media forums we can do this. 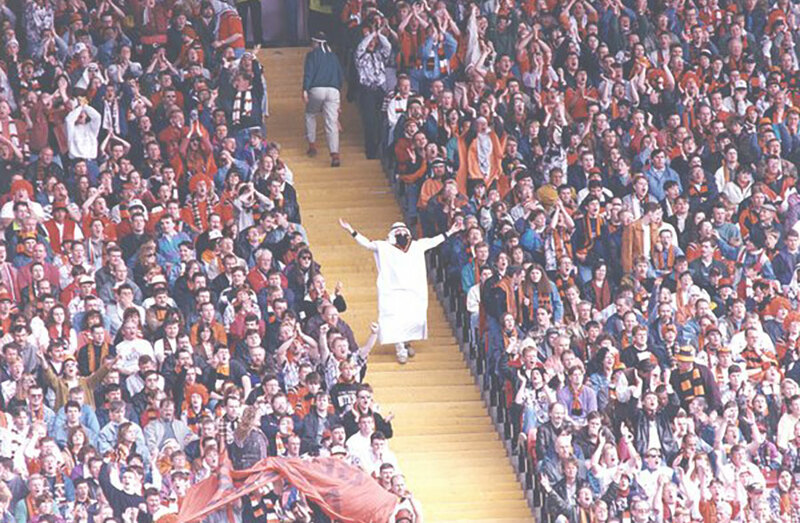 Would be obliged for your feedback on the above and hopefully we have started taking the small steps to make Tannadice a better place to visit. Lastly we would also confirm that Joe is doing heaps of work behind the scenes individually to improve the experience and this will be in print shortly.